Eileen Wieder Crone seeks out solutions to achieving wellness, physically and spiritually. She currently studies Shamanism with Brant Secunda, Patricia Jones and Sierra Bender. 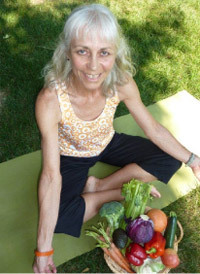 She became a Living on Live Food Teacher in 2009, after making the leap from a vegan diet to a raw, living diet. In June, 2010, Eileen completed the Benefits of Raw Food Nutrition Certificate Course at Living Light Culinary Arts Institute in Fort Bragg, California. More recently, in 2012, Eileen earned the title Certified Food-Healing Instructor, taking her training a step further--to using phytochemicals and specific nurients to conquer disease. She’s been teaching yoga since 2004 and is a Registered Yoga Teacher (E-RYT) at the 500-hour level. She’s passionate about both food and yoga. Eating a high-nutrient diet and practicing yoga allows the body to have energy, flexibility and resiliency. Most recently in November, 2018, Eileen achieved a Kripalu Mindful Outdoor Guide Certification; she is qualified to lead groups on mindful outdoor experiences in nature (aka Forest Bathing) to relieve stress and promote health. Eileen wants to be able to share her excitement with others, by teaching food and nutrition classes as well as vinyasa yoga classes. Transitioning or refining diet and adding or deeping yoga practice is vital in attaining high-level wellness and longevity.